The Gibson Brothers: Leigh (left) and Eric. 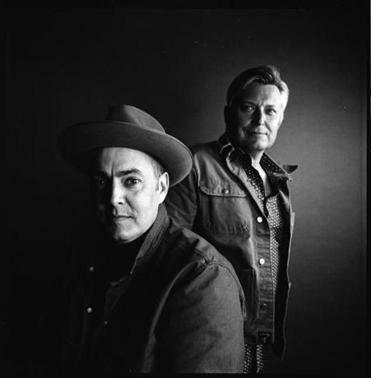 The Gibson Brothers are one of the premier acts in bluegrass, but at the moment they’re not in bluegrass at all. They’ve just released an album, “Mockingbird,” that ranges far outside of the genre that has been their home, and they’ve gone electric and added a pedal steel player to their band to perform it on tour. They’ll highlight the new record at the Bull Run Restaurant in Shirley Sunday. The seeds of “Mockingbird” were planted when the brothers, Leigh and Eric, sat down about a year ago to figure out their next project. They had released 13 bluegrass records over the course of their career and now they felt a little restless. So they started to think about recording some of the songs they’d written over the years that didn’t fit their bluegrass band, just to give them life. A short time later, Ferguson called back. He had talked to Dan Auerbach of Black Keys fame, who has become a prolific Nashville-based producer in his own right, and Auerbach had expressed interest in being involved in the project. In fact, he had suggested that he and the brothers get together to write songs, and then record what they came up with. The Gibsons took Auerbach up on his offer. They put the songs they had been talking about recording back on the shelf, went to Nashville, and co-wrote all but one of the 11 songs on their new album. “We built these all from the ground up around Dan’s recording studio kitchen table, with Dan and some other writers. Every day we wrote, there would be the two of us, Dan, and another writer,” Eric explains.